Votes are being counted in Liberia's second presidential election since a 14-year civil war ended in 2003. Election officials said Tuesday's vote went off peacefully, with no violence reported. She was awarded the Nobel Peace Prize last week - a decision denounced by Mr Tubman and other candidates. This is the first election Liberia's National Elections Commission has organised as the previous one was run by the UN. Its chairman James Fromoyan said provisional results would be released on Thursday. "The commission is pleased that the process has unfolded in a quiet atmosphere," he said. African Union observer mission head Speciosa Wandira said she hoped the rival candidates would accept the result. "From what I see, there is no reason to worry," she said. 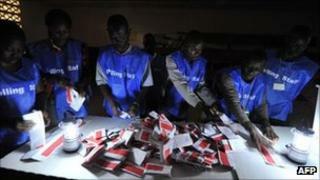 African elections are often marred by allegations of rigging and violence after results are announced. Some 8,000 UN peacekeepers have been deployed across Liberia to prevent any violence. Sixteen candidates contested the poll, but the BBC's Jonathan Paye-Layleh in the capital, Monrovia, says it is expected to be a two-horse race between Mrs Sirleaf and Mr Tubman. His running mate is ex-football star George Weah, who was beaten by Mrs Sirleaf in the 2005 poll. Long queues formed at polling stations, with many people braving heavy rains to vote. President Sirleaf praised the voters for their patience and discipline. "I feel so good for the Liberian people, they have demonstrated a certain level of political maturity." Mr Tubman, running under the banner of the Congress for Democratic Change (CDC) party, told the BBC that turnout was "huge" - a sentiment backed by former Nigerian head of state Yakubu Gowon, who was observing the the election. Our correspondent says central Monrovia has been transformed since the end of the war, with roads paved and many new buildings. While Mrs Sirleaf is well regarded by the international community, some analysts say she is less popular at home and predict a tight race, possibly going to a run-off. "One out of every three Liberians cannot feed themselves. They live in abject poverty. And they couldn't care less about the Nobel prize," said 60-year-old opposition candidate Charles Brumskine. She has apologised and the pair later fell out but Liberia's Truth and Reconciliation Commission said she should be barred from holding public office. Voters were also choosing members of the House of Senate and House of Representatives. Can Liberia's leading lady fight off election challenge?